It’s no surprise that there are so many ways to put together greeting card verses. However, if you’re working on exceptionally unique cards, why stop there? As an added advantage, you can use the unique features of the cards to come up with cool and funny greeting card messages. Note that this page only shows one greeting card writing for each featured card. However, some of the cards have many more phrases. Hence, click on them to see their respective pages containing additional examples. Click here for others including wedding anniversary message. But I have you to keep me warm. Click here for parents-to-children option and a wedding anniversary verse. Click here for other messages. Click here for more greeting card phrases. Click here for another verse that uses the "Diva" theme. My One. My Only. My Valentine! Click here for larger image of card. If the color goes against the norm and makes it stand out, then use it! It's no argument that purple is not a Christmas color. However, for a purple lover, this doesn't matter. Hence, give an extra dose of that color in the greeting card sayings, and you'll end up with funny Christmas greeting card verses. Dreaming of a purple Christmas? I guess your wish just came true! Want a different purple Christmas card verse? For the unique card, you can still get inspirations for the greeting card phrases from its ordinary card features. This doesn’t make it any less of a card. Instead, it could even help create better greeting card sayings. For example, in the featured card, there’s nothing exceptional about using blue color to make a card. 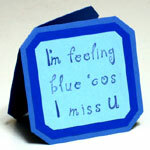 Nonetheless, the color fits the “blue” miss you greeting card messages perfectly. By the way, do you know why this blue paper-craft below falls into the realm of unique cards? even stand the color blue anymore. Click here for other funnier greeting card verses that suit the blue nature. In fact, there are many ways to make unique cards. This means there are so many more ways to use the unique card features to come up with funny greeting card verses. So, what other greeting card phrases come to mind?